Modernization has brought increased comforts and limited mobility in our lives at the cost of increased prevalence of hypertension, diabetes mellitus, dyslipidemia, and obesity, which are predecessors of major cardiovascular disease. Evidence suggests most of these diseases were rare before the present century and their prevalence has increased during the past 50 years, with significant association with diet patterns, lifestyle changes, and mental stress.,, The prevalence of metabolic syndrome has reached epidemic proportions in a developing country like India. Yoga, an effective alternative to traditional aerobic and strength training program, requires little space, no equipment and is with limited side effects. It focuses on relaxation, body awareness, and meditation and provides a qualitatively different exercise experience which may be perceived as less strenuous and more pleasurable. The regular practice of yoga brings about the integration of the body, mind, and breath to produce structural, physiological, and psychological effects in an individual who practices it. The effectiveness of yoga against stress management is well established., It has been hypothesized that yoga causes a shift toward parasympathetic nervous system dominance, possibly via direct vagal stimulation. Yoga provides a holistic healing of the individual. The philosophy of yoga perceives the mind and body as an integrated unit, for which it is considered a mind–body science. It teaches that “given the right tools and the right environment, the mind–body can find harmony and heal itself.” Yoga calms and relaxes the mind, strengthens and tunes the body, and brings them into harmony with one another. There are many forms of yoga, starting from simple breathing exercise to complex physical exercises and postures. In short, during directing the mind and body, the ways of yoga passes through pranayama-controlled breathing exercises to asanas-postures, which are held for a certain period of time; thereby facilitating the development and integration of the body, mind, and soul. In a fast moving world, where time limits the daily exercise schedules, a comprehensive yoga practice which does not take away too much of daily time can be a purposeful alternative. Yogic practice brings about beneficial effects on cardiovascular, respiratory, and metabolic functions as proven by available evidence. However, the predominant contributions in this series are studies analyzing the physiological effects of long-term yoga practice. Effects of short-term yoga practice on metabolic and autonomic functions need still to be consolidated. Hence, we designed an interventional study to evaluate the effect of short-term yoga practice by healthy volunteers on cardiovascular function, pulmonary function, body mass index (BMI), blood glucose, lipid profile, and thyroid function. We designed an interventional study to evaluate the effect of yoga on cardiovascular function, pulmonary function, BMI, blood glucose, lipid profile, and thyroid function. The study was conducted in healthy volunteers attending yoga training at the district yoga training center which functions as a major school for people seeking yoga training, after obtaining institutional ethics committee approval and valid volunteer consent. The study was conducted during the period of 1 year from May 2012 to May 2013. The schedule of training lasted for a minimum period of 41 days. The sample size was calculated by a method similar to a pilot study. Volunteers were free of financial concerns incurred as a part of the study. Volunteers recruited belonged to either gender, age 22–55 years, with minimum 85% attendance in yoga sessions and practicing yoga for a minimum period of 75 min/day, 6 days/week, for a minimum period of 41 days. Those who had any systemic or mental illness, on any chronic medications or those with tobacco or alcohol use were excluded. Those who were practicing yoga previously were also excluded. Fifty healthy volunteers who fulfilled the inclusion criteria started to practice yoga at the study center and were explained in detail about the study. Initial evaluations of the subjects were done 2 days prior to the commencement of the yoga course. The subjects were advised to come after overnight fasting and blood samples were taken for the estimation of fasting blood sugar, lipid profile ([serum total cholesterol, serum triglycerides, high-density lipoprotein [HDL], and low-density lipoprotein [LDL]), and thyroid function tests thyroid stimulating hormone (TSH, free triiodothyronine [Free T3], free thyroxine [Free T4]). The cardiac and pulmonary functions were tested on the next day using a portable digital electrocardiogram (ECG) (BPL Cardiart ECG Machine 6108T, Hi - Tech Equipments, Inc, Kolkata, West Bengal, India) and pulmonary function tests (PFTs) (MIR SPIROBANK II 910575, AliMed, Dedham, Massachusetts, USA) machines, respectively. The values obtained were recorded as the preyoga values (basal values). Further tests were done to assess their cardiopulmonary functions. Subjects were instructed not to have tea, coffee, or cola 12 h prior to the tests and advised to have light breakfast 2 h before the tests and were asked to relax in the supine position for 30 min prior to tests. Cardiovascular parameters assessed include resting heart rate, systolic blood pressure, diastolic blood pressure, mean arterial pressure, and cardiovascular autonomic function tests. Cardiovascular autonomic functions were done using ECG machine, sphygmomanometer, and hand grip dynamometer (INCO Ambala India) The tests were explained and demonstrated to the subjects. The procedure of the autonomic function tests was done as described by Ewing et al. Autonomic functions assessed include sympathetic heart rate response to standing and heart rate response to deep breathing, and parasympathetic-blood pressure response to standing and blood pressure response to sustained handgrip. PFTs were performed using portable electronic spirometer (MIR SpirobankII). Subjects were allowed to sit comfortably in a chair, with the procedure explained and demonstrated in detail. Tests were repeated until three acceptable and reproducible tracings were obtained. The parameters studied were forced vital capacity (FVC), forced expiratory volume in 1 s (FEV1), FEV1/FVC, and peak expiratory flow rate (PEFR). For estimation of thyroid function, the following values were considered within normal limits - Free T4: 9.0–22.2 pmol/L, Free T3: 1.2–4.2 pg/ml, and serum TSH: 0.3–6 mIU/ml. The yoga course of 41 days included meditation, brahma mudra, body awareness, anulomaviloma, and relaxation. The 75 min daily yoga practice included: 10 min – Savasana, 5 min – Pranayama (anulomaviloma), 35–45 min – Asana, 10 min – meditation (traditional audio-guided meditation), and 10 min – Savasana. The Asanas performed daily were one or more of Ardhatitaliasana, Poornatitaliasana, Vajrasana, Marjariasana, Pranamasana, Prasarithapadahastasana, Trikonasana, Parivrittatrikonasana, Padahasthasana, Utkatasana, Tadasana, Merudandasana, Vipareetamerudandasana, Uttanapadasana, Halasana, Sarvangasana, Matsyasana, Bhujangasana, Makarasana, Shalabhasana, Dhanurasana, Pawanamukthasana, Ardhamatsyendrasana, Paschimottasana, Kandharasana, and Savasana performed for separate 5 min. Adherence to the program (as a percentage of yoga sessions completed) and asana performance were monitored during the study. During the asanas, all participants were encouraged to stretch maximally, maintain attention to their breathing. Adequate time for relaxation was also given. Special care was taken to make sure that no injuries or discomfort occurred during practice sessions. All the tests were repeated after the yoga course of 41 days. Data were tabulated in a Microsoft Excel spreadsheet and analyzed using computer software, Statistical Package for Social Sciences (SPSS) version 18, SPSS Inc. Released 2009. PASW Statistics for Windows, Version 18.0. Chicago: SPSS Inc. Data were expressed as a mean and standard deviation before and after yoga practice. Paired t-test was used to compare the mean values. The gender distribution of the study population were as male n = 22 (44%) and female n = 28 (56%). Age of volunteers ranged from 25 to 55 years (37.24 ± 9.242). The age distribution in age groups 21–30, 31–40, 41–50, and 51–60 years were as - n = 15, 15, 14, and 6 (30%, 30%, 28%, and 12%), respectively. Age and gender distribution of study population was comparable. 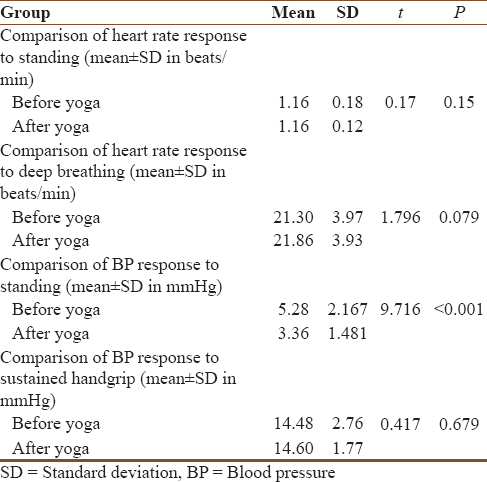 Cardiovascular functions assessed before and after yoga are as in [Table 1]. Autonomic function tests and PFTs before and after yoga are plotted in [Table 2] and [Table 3], respectively. 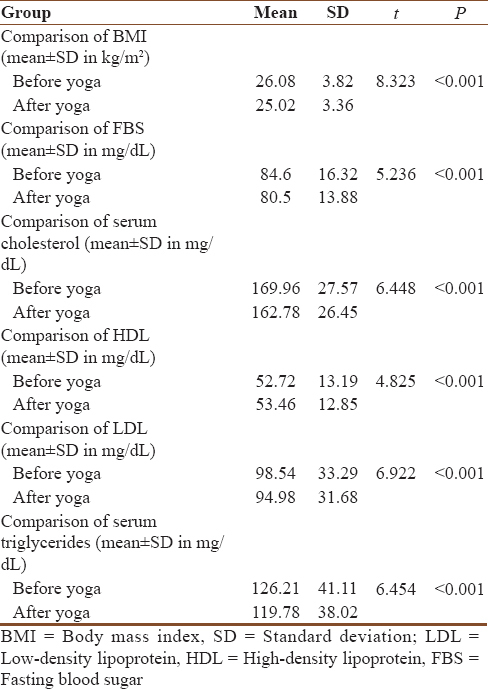 BMI, lipid profiles, and thyroid function tests were also analyzed before and after yoga [Table 4] and [Table 5]. A regular practice of yogasana is a convenient alternative to enhance physical activity in individuals. At least, 15 million Americans have practiced yoga at least once in their lifetime. Such study is not available in India. The present study reveals the effects of yoga practice on cardiopulmonary and metabolic functions of healthy volunteers over a period of 41 days. Our study is a unique effort to quantify the effects of yoga on thyroid function and metabolism in addition to consolidating the proven cardiovascular and pulmonary benefits. Till date, very few studies have investigated the effect of yoga on thyroid function. The people belonging to the age group of 25–55 years are the core group people who are expected to support the young and the old. The economic progress and development of a country largely depend on this age group in particular who are nondependant. The significant decrease in resting heart rate (4.16%), systolic (2.26%), diastolic (1.49%), and mean arterial blood pressure (2.37%) after the yoga practice in our study is in accordance with the findings of other studies on physiological effects of yoga practice in healthy individuals. Chu et al. conducted a systematic review and meta-analysis of randomized controlled trials of studies assessing the effectiveness of yoga in modifying cardiovascular risk factors. Performance of yoga showed significant improvement for BMI (0.77 kg/m2 [95% confidence interval (CI) 1.09–0.44]), systolic blood pressure (5.21 mmHg [8.01–2.42]), LDL cholesterol (12.1 mg/dl [21.80–2.48]), and HDL cholesterol (3.20 mg/dl [1.86–4.54]). Moreover, significant changes were seen in body weight (2.32 kg [4.33–0.37]), diastolic blood pressure (4.98 mmHg [7.17–2.80]), total cholesterol (18.48 mg/dl [29.16–7.80]), triglycerides (25.89 mg/dl [36.19–15.60], and heart rate [5.27 beats/min [9.55–1.00]). No significant changes were found for fasting blood glucose (5.91 mg/dl [16.32–4.50]) and glycosylated hemoglobin (0.06% Hb [0.24–0.11]). The authors suggested yoga as an alternative to traditional aerobic exercises in those who prefer not or cannot do the latter. However, the study did not evaluate the effects of yoga on thyroid function. Further to this, Kwong et al. attempted to evaluate the effectiveness of yoga in the secondary prevention of coronary heart disease (CHD), in men and women (aged 18 years and over) with a diagnosis of acute or chronic CHD, in the Cochrane systematic review. The authors could not find any study satisfying the eligibility criteria, a follow-up duration of 6 months or more, of the review. The authors concluded that effectiveness of yoga for secondary prevention in CHD remained uncertain in the absence of high-quality randomized control trials. The reductions in resting heart rate, systolic blood pressure, diastolic blood pressure, and mean arterial blood pressure in our study were attributed to modulation of autonomic activity where there is a parasympathetic predominance. The modulation is mediated through modification of breathing patterns, which triggers various central and autonomic mechanisms along with mechanical and hemodynamic adjustments causing both tonic and phasic changes in cardiovascular functioning. Effects of cardiovascular autonomic functions of yoga in our study were variable with only blood pressure response to standing showing significant response –36.36% reduction in fall in systolic blood pressure while standing (attenuation of orthostatic hypotension). Limited sensitivity and specificity of these tests since its description might have confounded the results. The duration of our study was probably not sufficient to bring about the improvement in the parasympathetic activity. Liu et al. evaluated the effects of yogic training in patients with chronic obstructive pulmonary disease in their meta-analysis. The primary outcomes studied were FEV1, FEV1% predicted (% pred). Secondary outcomes were 6 min walking distance (6 MWD), arterial oxygen tension (PaO2), and arterial carbon dioxide tension (PaCO2). Weighted mean differences (WMDs) and 95% CIs were calculated, and heterogeneity was assessed. Yoga training significantly improved FEV1 (WMD: 123.57 mL, 95% CI: 4.12–243, P = 0.04), FEV1% pred (WMD: 3.90%, 95% CI: 2.27–5.54, P < 0.00001), and 6 MWD (WMD: 38.84 m, 95% CI: 15.52–62.16, P = 0.001). However, yoga training had no significant effects on PaO2(WMD: 1.29 mmHg, 95% CI: –1.21–3.78, P = 0.31) and PaCO2(WMD:–0.76 mmHg, 95% CI: –2.06–0.53, P = 0.25). Improvements in lung function were subject to the length of yoga training and the type of practice used. Similar analysis in asthma patients was conducted by Cramer et al. Evidence for effects of yoga compared with usual care was found for asthma control (risk ratio: 10.64, 95% CI: 1.98–57.19, P = 0.006), asthma symptoms (standardized mean difference: 0.37, 95% CI: 0.55–0.19, P < 0.001), quality of life (SMD: 0.86, 95% CI: 0.39–1.33, P < 0.001), PEFR (SMD: 0.49, 95% CI: 0.32–0.67, P < 0.001), and ratio of FEV1 to FVC (SMD: 0.50, 95% CI: 0.24–0.75, P < 0.001). Evidence for effects of yoga compared with psychological interventions was found for quality of life (SMD: 0.61, 95% CI: 0.22–0.99, P = 0.002) and PEFR (SMD: 2.87, 95% CI: 0.14–5.60, P = 0.04). Authors concluded yoga an alternative to breathing exercises for asthma patients interested in complementary interventions. A significant reduction (4.06%) in BMI was observed in our study along with a decrease in fasting blood sugar (4.84%), cholesterol (4.22%), triglycerides (5.09%), LDL s (3.6%), and increase in HDL (1.4%). No significant changes were observed in thyroid function tests. A long course of time and practice of specific yogasanas like sarvagasana may be needed to produce any observational changes in thyroid function. In contradiction to our results, Gordon et al. reported a significant decrease in TSH level and a significant increase of FT4, in patients with end-stage renal disease after 4 months of yoga practice. This may be because of long duration of the yoga practice which produces significant changes in thyroid function. The limitations of our study are absence of a control group, subjective nature of values recorded for PFTs, and unforeseen intrinsic laboratory errors. We had included a broader range of age for the study group, in which few postmenopausal women were also involved. There is a possibility that in the perimenopausal age could alter the autonomic function; however, the involved subjects were receiving hormone replacement therapy and could actively involve in a 41 day, 75 min training, substantiating the term healthy volunteers in our study. After yoga practice, there was a significant reduction in the resting heart rate, systolic blood pressure, diastolic blood pressure, and mean blood pressure of the participants. Effects on autonomic function tests were variable and inconclusive. 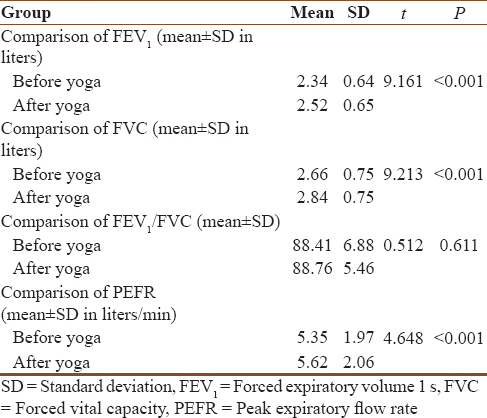 There was a significant increase in FVC, FEV1, and PEFR after yoga. A significant reduction in BMI was observed. Effects on metabolic parameters were promising with a significant reduction in fasting blood sugar level. Serum total cholesterol, serum triglycerides serum LDL levels, and significant increase in HDL. There was no significant change in thyroid function tests after yoga. Dr. K.P. Kalyanikutty for supervision of the study. Burkitt DP. Some diseases characteristic of modern western civilization. Br Med J 1973;1:274-8. Vaillant GE, Mukamal K. Successful aging. Am J Psychiatry 2001;158:839-47. Fraser GE, Shavlik DJ. Ten years of life: Is it a matter of choice? Arch Intern Med 2001;161:1645-52. Steyn K, Fourie J, Bradshaw D. The impact of chronic diseases of lifestyle and their major risk factors on mortality in South Africa. S Afr Med J 1992;82:227-31. Pappachan MJ. Increasing prevalence of lifestyle diseases: High time for action. Indian J Med Res 2011;134:143-5. Hagins M, Moore W, Rundle A. Does practicing hatha yoga satisfy recommendations for intensity of physical activity which improves and maintains health and cardiovascular fitness? BMC Complement Altern Med 2007;7:40. Woolery A, Myers H, Sternlieb B, Zeltzer L. A yoga intervention for young adults with elevated symptoms of depression. Altern Ther Health Med 2004;10:60-3. Telles S, Nagarathna R, Nagendra HR, Desiraju T. Physiological changes in sports teachers following 3 months of training in yoga. Indian J Med Sci 1993;47:235-8. Ewing DJ, Martyn CN, Young RJ, Clarke BF. The value of cardiovascular autonomic function tests: 10 years' experience in diabetes. Diabetes Care 1985;8:491-8. Rawal SB, Singh MV, Tyagi AK, Selvamurthy W, Chaudhuri BN. 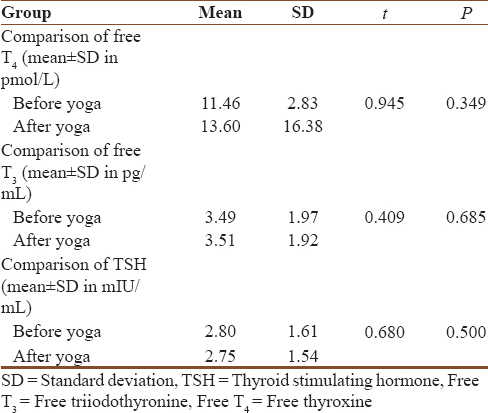 Effect of yogic exercises on thyroid function in subjects resident at sea level upon exposure to high altitude. Int J Biometeorol 1994;38:44-7. Murugesan R, Govindarajulu N, Bera TK. 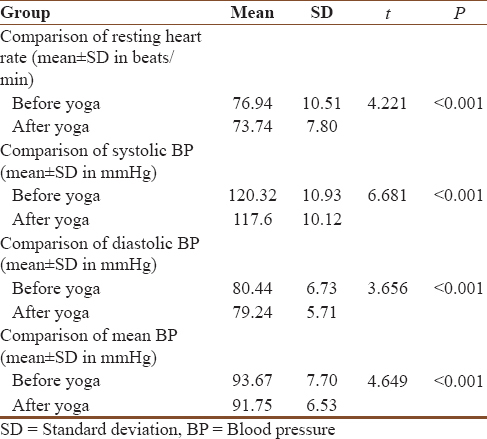 Effect of selected yogic practices on the management of hypertension. Indian J Physiol Pharmacol 2000;44:207-10. Damodaran A, Malathi A, Patil N, Shah N, Suryavansihi, Marathe S. Therapeutic potential of yoga practices in modifying cardiovascular risk profile in middle aged men and women. J Assoc Physicians India 2002;50:633-40. Katiyar SK, Bihari S. Role of pranayama in rehabilitation of COPD patients – A randomized controlled study. Indian J Allergy Asthma Immunol 2006;20:98-104. Chu P, Gotink RA, Yeh GY, Goldie SJ, Hunink MM. The effectiveness of yoga in modifying risk factors for cardiovascular disease and metabolic syndrome: A systematic review and meta-analysis of randomized controlled trials. Eur J Prev Cardiol 2016;23:291-307. Assessment: Clinical autonomic testing report of the Therapeutics and Technology Assessment Subcommittee of the American Academy of Neurology. Neurology 1996;46:873-80. Joshi LN, Joshi VD, Gokhale LV. Effect of short term 'Pranayam' practice on breathing rate and ventilatory functions of lung. Indian J Physiol Pharmacol 1992;36:105-8. Sodhi C, Singh S, Dandona PK. A study of the effect of yoga training on pulmonary functions in patients with bronchial asthma. Indian J Physiol Pharmacol 2009;53:169-74. Liu XC, Pan L, Hu Q, Dong WP, Yan JH, Dong L. Effects of yoga training in patients with chronic obstructive pulmonary disease: A systematic review and meta-analysis. J Thorac Dis 2014;6:795-802. Cramer H, Posadzki P, Dobos G, Langhorst J. Yoga for asthma: A systematic review and meta-analysis. Ann Allergy Asthma Immunol 2014;112:503-10.e5.